At mile marker 340 on I-94 looking west. Oil plume just to the left of the signage on the horizon stretching south. This afternoon while following up on a US-Dakota War historiographic line of research in the library at North Dakota State University, I received a few texts from a friend that read, “KFGO News says 7 oil tanker cars on fire, many have exploded near Casselton.” More went up after this text. This raised my eyebrow. It’s not often that oil tanker cars blow up in North Dakota, and my first thought was, “I sure hope this wasn’t in downtown Casselton.” I was thinking I would just stay in the library, but I also thought about how seeing something first hand is different from seeing it on the flatscreen. Historians are fanatics about primary sources. “Might as well make a contribution,” I thought. 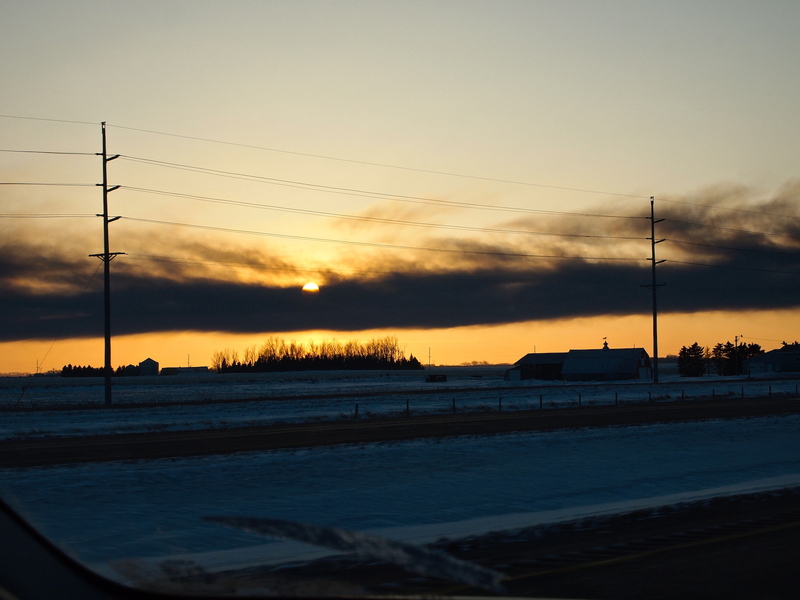 A horizontal smoke from the oil explosion in Casselton, North Dakota. The setting sun just dipped behind it. Molly and I drove out west of Fargo on I-94 to Casselton, about a 20 minute ride one way. Here are some of the raw observations: when we started in Fargo, the temperature was -3°F, and when we finished up in Casselton it read -5°F. Sun dogs were also out to the right and left of the sun. Wind was steady out of the north. 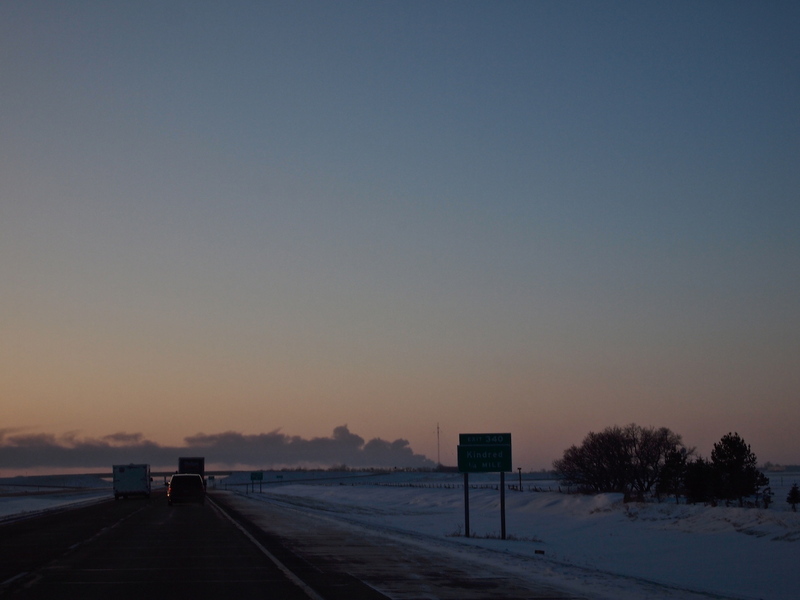 As we left Fargo, the sun was setting and snow wisped north-south over the interstate. By mile marker 340, we discerned that the horizontal haze in the distance was indeed produced by the burning oil. Since the wind was blowing hard from the north, this horizontal streak stretched south over the horizon. In the flat Red River Valley of the north, this means that the streak stretched south and was visible for a very, very long way. The setting sun dropped behind this streak, some photos of which are included. 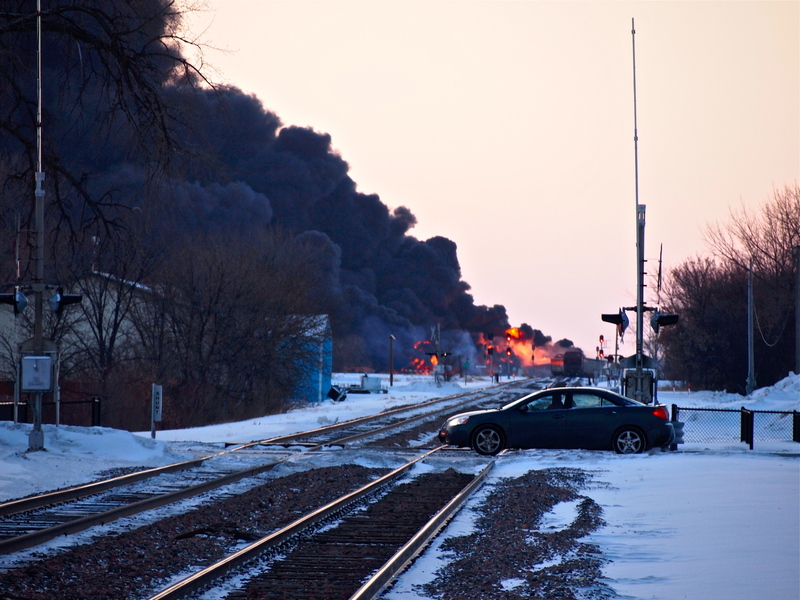 Photo looking west toward the oil fire in Casselton, North Dakota. numerous ways. Then I thought about how the world — all of us — have been born into a culture that relies on petroleum. It’s kind of a cultural inertia, something America, the West and the world has been increasingly addicted to at least since the turn of the 19th century. It seems that until oil becomes expensive enough, there will not be a massive enough cultural effort to harness other energy sources. We see signs of it, of course, with wind turbines and the hydroelectric. But it’ll be a while before all of these other alternatives eclipse petroleum. That’s kind of the way with the petroleum industrial complex. There is plastic all around us, too. This entry was posted on Monday, December 30th, 2013 at 6:54 pm	and tagged with Bakken, Canada, Casselton, Cold Weather, History, North Dakota, Petroleum, Punk Archaeology, Railroads, Winter and posted in Uncategorized. You can follow any responses to this entry through the RSS 2.0 feed. I’m with CNN and saw your video and photos of the explosion in Casselton, can you please contact me at Justin.Lear@CNN.com. Have a good day.